Summer bloggin' is one of my favourite features on the blog. 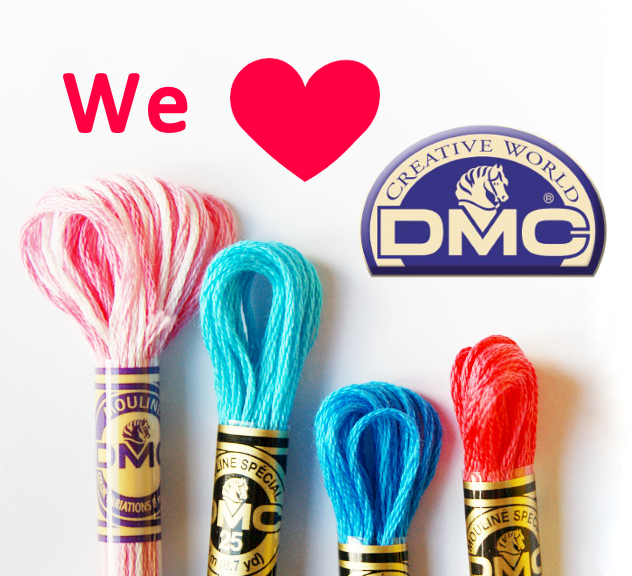 It's all about bringing you fresh and original content straight from our little stitchy community! Today we are kicking off with a contribution from Rachel and for the next six weeks or so you'll be treated to a new guest blogger once or twice a week. Rachel lives in Charleston, Illinois with her son Eliot and teaches Freshman Composition at the Eastern Illinois University. According to her own description Rachel is a "nerdy, book-loving weirdo, a staunch feminist, and a wannabe writer". In her &Stitches debut Rachel explains about how she translates everyday inspiration into fabulous embroidery. Over the last few years, I’ve begun to think about stitching so much that it seems my brain automatically translates everything I see into floss and fabric. Everyday inspiration abounds. For example, my family and I recently moved to a new home, and while unpacking, organizing, and arranging the bathroom, my attention kept getting drawn to the window. As you’ll notice from the left side of the photo, the bathroom window looks directly out onto the apartment complex next door. 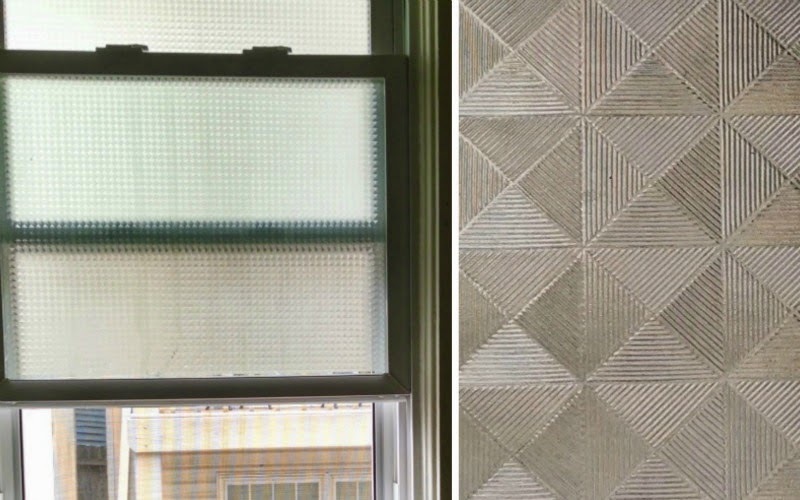 To keep neighbors from having a prime view of themselves on the toilet, previous residents of our home applied a patterned film to the window, rendering the glass opaque and lending a bit of needed privacy. When I looked closer at the window and began to see the pattern in it, however, all I could think of was cross stitch. The lines forming triangles, forming squares, forming diamonds, and the repetition of the pattern made me eager to pick up some Aida cloth and start experimenting. 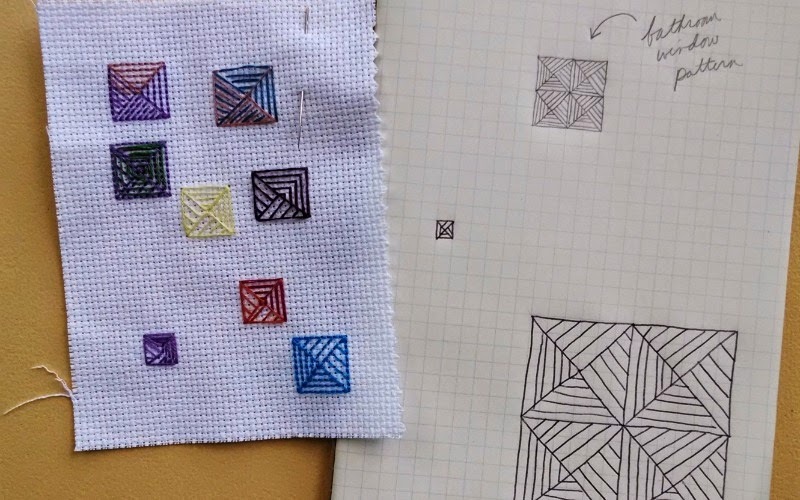 First, I did a bit of doodling in my graph paper sketch book, just to get the pattern down on paper and think about how it might translate to a cross stitch pattern. Then I grabbed a needle and some leftover bits of floss and started “drawing” the pattern onto my fabric. I keep a tangled heap of leftover threads that I use for practicing new stitches or patterns, so I drew from it here, mixing in different colors and numbers of strands. I ended up favoring a monochromatic look. In the end, I settled on four shades of Sublime Stitching floss that reminded me of a yummy, summery sherbet (see first photo). 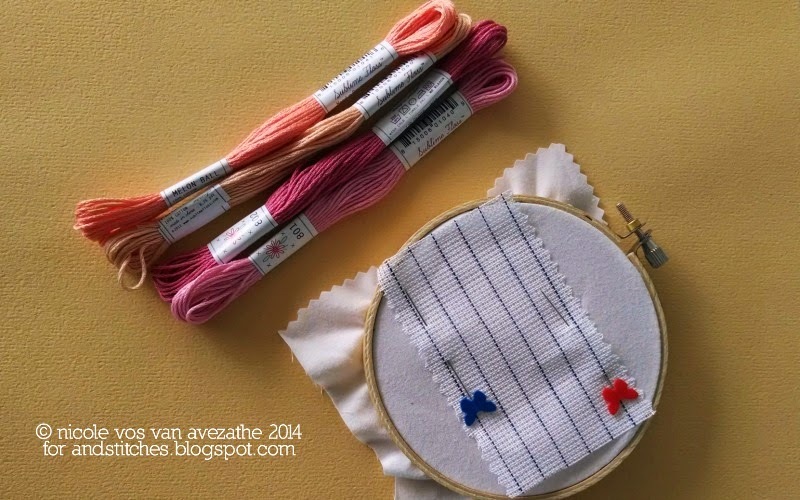 I used waste canvas to stitch the version of the pattern I most preferred onto some plain white fabric. There are also plenty of great water soluble waste canvas options out there, but I kind of enjoy the meditative work of pulling out the tiny threads with a needle and tweezers. I really like how this tiny piece turned out, and I think I’ll be mounting it into a gold colored jewelry finding to make a necklace. Of course, I think it would also make a great larger, framed piece if several of the patterns were stitched side by side. 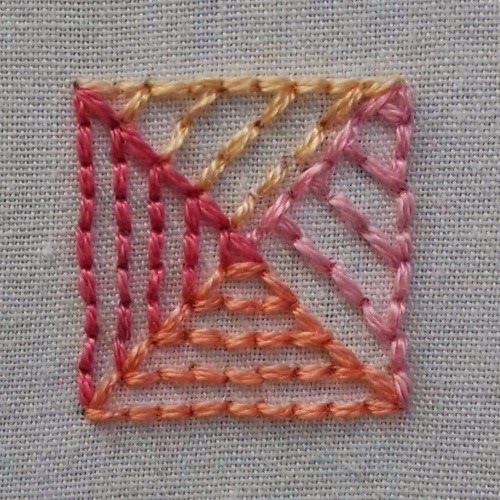 You could also change up the colors of the floss to make variations, much like in a quilt pattern. When set side by side, different parts of the pattern would become more prominent. What would you do with this bit of inspiration? Why not take a look around you today, and make note of the patterns, colors, and shapes that appear in your everyday world? Chances are, there’s something beautiful out there, just waiting to be translated into stitches. Thank you for a wonderful and inspiring post Rachel! Find out more about Rachel and her embroidery work via her Blog, Pinterest, Flickr, Instagram, Twitter and Etsy.